"Urban is fantastic, I learnt in a BMW Mini, how cool is that"
Catherine Doyle, passed first time, May 2007 at Winchmore Hill. Before you begin learning to drive you will need to obtain a provisional licence and be at least 17 years old. To apply for a provisional licence, complete the application form D1 and send it to the DVLA. All of our driving instructors are DSA (Driving Standards Agency) approved, and we pride ourselves in being one of the most flexible driving schools in London. Before you can take the practical driving test, you must first take and pass the theory and hazard perception test. You can book your theory test online using the Driving Standards Agency website or by calling them. 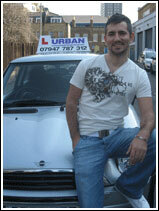 Your driving lessons will be structured around your schedule at a pace that suits you. No matter whether it's one lesson a week or an intensive course, choose Urban for the ultimate learning to drive experience. The practical driving test will last approximately 40 minutes. It will start with an eyesight test and then with two vehicle safety check questions. You will then be examined on your general driving and on two reversing exercises. You are allowed up to 15 driving faults, any more than this will result in failure. One or more serious or dangerous faults will also result in failure. Once you've passed your practical driving test you can then talk to your instructor about the pass plus scheme which will save you up to 40 per cent on your car insurance.